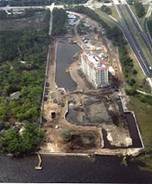 Synergy designed a 2 lane -30 foot span single arch bridge including traffic impact resistant railings and a “bridge tender’s” tower to connect a 40 unit townhouse community constructed on an island located within a lake in the Palencia community by Hines Corporation north of St. Augustine. The design included 1800 linear feet of 10 foot high geogrid restrained masonry block retention walls around the island that received surcharge loading from the buildings which were located as little as 0 feet away . The work also included design of the entry monument, traffic circles, screen walls, fountains and planters which were defined by Prosser Hallock, the Landscape Architect / Civil Engineer, for the project. Construction was completed in 2004 at a cost of $3,000,000 for the site/civil aspects of the job. The project was developed by Trident Realty Corporation of Ponte Vedra, FL. Currently designing the hardscape structures, including trellis, planters, kiosks, retaining walls and a bathroom pavilion for a plaza designed to host private group functions. The landscape designer is Terra Design Studios of Pittsburgh, PA. working for the project architect, Rink Design, and the City of Jacksonville. The construction budget is $1,000,000 with work scheduled to commence in the first quarter of 2007. Synergy performed design over a linear mile of boardwalks through environmentally protected marshes and wetlands in order to interconnect the neighborhoods with the natural environment of the Tolomato River and Stokes Creek. The design included stake out survey in order to avoid removing trees that would need to be replaced per county tree ordinance. A topographic survey was also performed in order to control the boardwalk deck elevations in order to be in compliance with Department of Environmental Protection regulations, Americans with Disabilities Act ramp limitations, and building code handrail requirements. The boardwalks were not only designed to handle pedestrian and golf cart traffic but also for transporting construction materials to otherwise inaccessible areas of the site, including Georgia Buggies loaded with concrete. J&D Marine is constructing the project for a cost of $2,000,000. Work began in March 2006 and is scheduled to be completed by the end of the year. Synergy performed structural modifications for a dozen lift stations which were located below flood elevation as part of Hillsborough County’s hurricane preparedness improvements. Lift station modifications were prescribed by the project civil engineer, Jones Edmunds & Associates which included raising finished grade of some of these sites by as much as six feet. The structural scope performed by Synergy included design of services pads, pipe supports, extensions of existing wet wells and valve vaults, aluminum service platforms and handrails, man way hatches, access roadways, highway guardrails, and perimeter wood fencing. Synergy designed steel bulkheads in order to maximize onsite retention of storm water runoff at several retail sites with limited available property. The bulkheads were designed to support construction and heavy truck surcharge loads. Cantilevered steel sheet piling was used at the pond boundaries adjacent to the property lines, however the walls at the remaining perimeter were restrained with helical anchors for economy. Additional cost saving design included adding a drainage system behind the bulkhead in order to reduce hydrostatic pressure and subsequently reducing the pile lengths and anchor quantities. This work was performed for Kangaroo via subcontract to the civil engineer for the project, Kimley-Horn. Synergy performed the structural design for the waterfront community including 4000 linear feet of bulkheads at the marina and intracoastal waterway, wooden fishing pier, two 12 story condominiums, yacht club, pool deck including bathhouse and pavilion, site retaining and screen walls, storm water outfalls, entry monument, guardhouse, trellis and arbor structures, monumental stairways, planters, obelisks, generator/dumpster enclosures and traffic circles. The total project is being constructed by Brasfield & Gorrie for a cost of $75 million for Vestcor. The marina, yacht club and first building are scheduled to be complete by the end of 2006. The second building will be completed by 2007. The project architect is Rink Design Partnership and Civil Engineer/Landscape Architect is Prosser Hallock. Synergy performed structural design and construction inspection of a 400 linear foot extension of the Northbank Riverwalk for Harbor Community Development at the direction of the civil engineer, Kimley-Horn & Associates. Work included design of the seawall caps, paving, planters, retaining walls, railings and tie-in with the existing riverwalk construction. The work was completed by Harbor Construction in 2006 at a cost of $500,000. Performed structural investigation repairs for a portion of the steel bulkhead and tieback system that failed from construction surcharge loads. Work was performed in 2002 for the University of Florida through Beers/ Skanska Construction Company. Synergy designed wooden retaining walls and the American with Disabilities Act pedestrian ramps and guardrails for a retail center with tiered parking levels. The walls were designed for construction and traffic surcharge loads for the parking lot above using dead men to restrain the tops of the piles. Construction was completed in 2004 by the client, RTM Resturant Group of Atlanta, GA. Performed structural design and construction inspection of six culvert / headwalls road crossings over Marshall Creek in the Palencia development by Hines. The crossings were designed ASHHTO H20 wheel loads for construction traffic and moving vans. The crossings were economically designed using counter restrained tiebacks in order to limit foundation sizes and wall embedment depths. The tops of the headwalls were arched and the walls were covered with stone veneer fascia to create an attractive finish for this upscale residential community. Synergy designed hardscape and 24 foot high geogrid retaining wall system for the central plaza of the Palencia community by Hines. The green serves as the hub between the clubhouse, golf course and residential building which are located around its perimeter. Located on an embankment over a lake, it provides impressive vistas of the adjacent golf course and surrounding community. The design integrated the retaining wall system of the golf clubhouse in order to produce $150,000 in savings by eliminating the need for temporarily shoring soils for the plaza while the buildings were erected at a later time. Structural deign included hardscape structures such as trellises, fountains, planters and monumental stairways. Retaining wall design included detailing of caps, corners railing, and tie-in with the building foundation retaining walls. All work was performed under the direction of the landscape architect, Prosser Hallock. The project was completed in 2004 at a cost of $1,400,000 by the general contractor, W.G Pitts.